Pre-heat the oven to 200oC, 180 oC fan, gas mark 6. Whilst the pasta is cooking, heat the olive oil in a large pan over a medium heat, and gently fry the garlic and onion for 5 minutes until soft, but not browned. Gently add both cans of Chopped Tomatoes, the Tomato Purée and a pinch of salt and pepper to the pan, and stir well. Cover and leave to simmer for a few minutes whilst you check the Pasta. 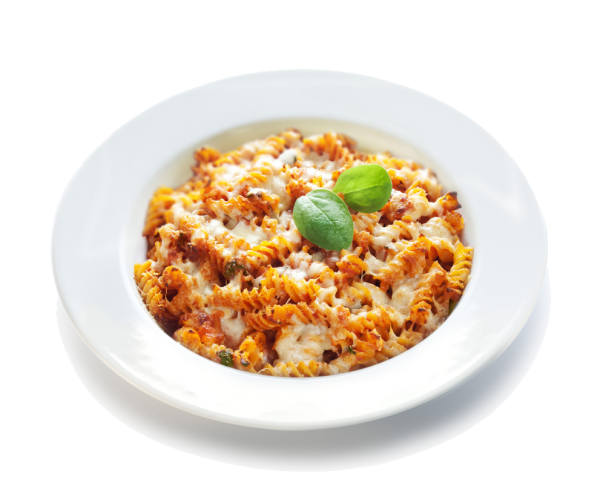 Check the pasta and when it is how you like it – ‘al dente’ or slightly softer – drain it and tip the hot, drained pasta into the sauce. Add the spinach and the sliced Mozzarella and mix until the Pasta is coated in the sauce. Put the mixture into an oven-proof dish and sprinkle the Grated Italian Cheese* (if using) and the grated Cheddar cheese over the top. Bake in the pre-heated oven for 15 – 20 minutes until lightly browned. For best results, remove from the oven and leave to cool for a couple of minutes before serving. Join in the enjoyment as your dish disappears!